Are you thinking about organizing a party bus tour Chicago? If you're somebody who loves to learn about architecture and history, a Chicago sightseeing tour is the perfect activity for you to organize with like minded friends. Whether you're just visiting Chicago or you're a long time resident of the city, you can have a great day touring around the popular spots. The great thing about booking with our company is that you can completely customize your own itinerary to view all of the spots you're looking forward to. You wont have to sit through a boring hour long explanation of something that doesn't interest you when you're the one in charge of the tour! Here are some of the most popular spots to sight see in Chicago. 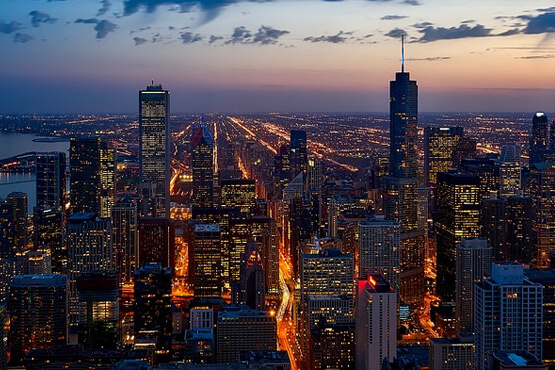 These are all worthy spots to consider adding to your party bus tour Chicago! Our drivers have experience going to all of these places as well as destinations that aren't listed, so you can be assured that you're in good hands here. Plus, our buses have wide windows that are ideal for getting the very best views. It only takes a little bit of time to organize your booking, so try to get a feel for the places you'd like to visit and get in touch with us to set it up. The views are unbelievably breathtaking from a thousand feet in the air! When you make the journey up to the top of the John Hancock Center, you'll find that they have interactive maps that allow you to locate all of the other landmarks in the area. Did you know that you can see four different states from the top of the tower here? Those who have a sense of adventure will love the Tilt portion of the building that tilts you out over the city at a thirty degree angle. Be sure to check ahead though, as they have started charging for admission and subsequently changed the name of the observation deck to 360 Chicago. This park is known for the giant reflective bean, but it's also a fantastic place for some people watching. The art fountain is a great way to cool off during the scorching summer heat. There are free concerts and events that happen all through out the year here, so you never know what you might come across! It's also known as the largest rooftop garden as it sits over a garage that's underground. The Navy Pier hosts what seems to be endless shops and attractions both indoors and outdoors. There's the Ferris wheel, over 50 acres of gardens, and kiosks selling interesting goods. You could easily spend an entire day adventuring through the Pier, especially when you consider that there's an IMAX theater inside. Be sure to clear your schedule to be able to take it all in! Here's another one for the thrill seekers! At the top of the building, you can walk out into the series of glass ledges that are straight out of the building. It's quite cool to be able to watch the traffic right below you! It's the second tallest skyscraper in the Western hemisphere, and there are over 110 stories inside of the building.